Research shows that listening to ambient sounds while studying increases concentration, and Google Trends confirms that students are already using this technique. 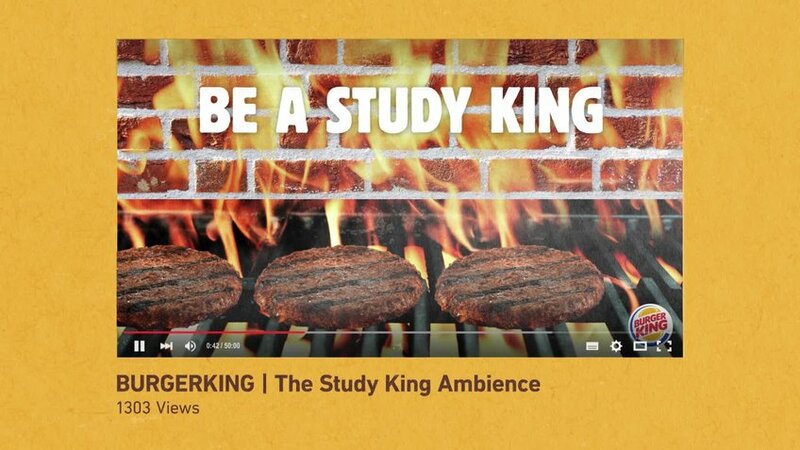 Burger King presents Be A Study King, a campaign that allows you to study to the sound of Flame-Grilled Whoppers in a YouTube-ad lasting for 50 minutes. As a reward, you’ll get a free Whopper coupon on the campaign website. To get attention, Burger King will execute a stunt at a University by placing the King’s table with sound shower technology mounted above throne chairs. This way Burger King helps students study better.